How to read load test result in SoapUI? Test Step - The name of the test step executed in the test. min - The best response time in milliseconds for this test step. max - The worst response time in milliseconds for this test step. avg - The average response time in milliseconds for this test step. last - The response time in milliseconds of the last execution of this test step. cnt - The number of executions performed for this test step. 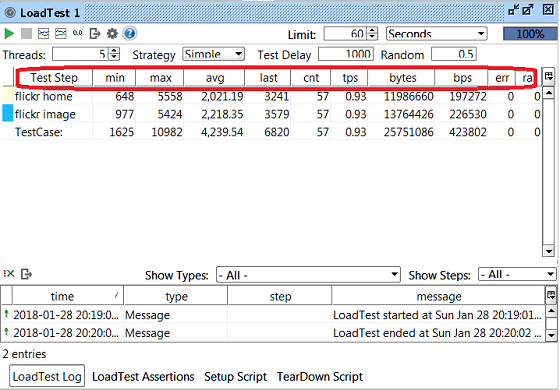 tps - The throughput of this test step as the number of execution per second. bytes - The total number of bytes processed by this test step. bps - The number of bytes per second processed by this test step. err - The number of execution failed on this test step. rat - The failing rate for this test step.